Kids should know about one of the largest civil engineering projects in the world: the Deep Tunnel project in and around Chicago. This is from the Riverworks exhibit at the Peggy Notebaert Nature Museum in Chicago. While some of the pieces of the exhibit failed to work the day we visited, I think I could see the purpose of the The Deep Tunnel exhibit: the floodwaters would be diverted away from the city. The concept may appear simple and explainable to kids but the execution in real life is not. The exhibit suggests the flooding the past is now alleviated by Deep Tunnel. Yet, the problems are likely to go on in a region that continues to expand and change. Remediating water and flooding issues is a very difficult task compared to altering development at the beginning. It is interesting to think how else this engineering feat could be presented to children. I could imagine a scaled model that kids could walk through to help give them a sense of the size of the sewers needed as well as the size of some of the water reservoirs. Deep Tunnel is not intended for minor amounts of water; this is supposed to help protect millions of people on a fairly regular basis. Communicating the sheer size could fascinate kids. Or, perhaps some sort of computer game where kids play the role of an engineer or expert as they make choices about where to divert water. Come to think of it, where is this version of Simcity or Roller Coaster Tycoon – “Infrastructure Builder” or “Sewer Wars” or something catchier. Why do children’s books spend so much time on infrastructure and construction yet there is little formal instruction on these topics later? Yesterday, I walked to the nearest bank and watched some construction going on. The work appeared to involve digging underneath the side of a street, possibly to deal with a pipe or some kind of wire. I was struck that while many neighbors or drivers would find such a sight a nuisance, many kids would be fascinated. Plenty of books for children involve infrastructure and construction. These books discuss vehicles, what is underground, and how items get from one place to another. The emphasis on big machines doing physical work and the mobility of it all seems attractive to kids. (I would guess much of this attraction is due to socialization.) But, if I think back to my schooling, we spend little time analyzing and discussing these basic systems that are essential to all of our lives: electricity and electrical lines, plumbing and sewers, Internet cables, roads and highways, pipelines, gas lines, railroads, trucking, waterways, airplanes and airports, and other crucial pieces of infrastructure. Why? In many ways, it would not be hard to incorporate these topics into multiple subjects. The first example that came to mind would be a unit about railroads. These are essential for moving goods long distances. Various subjects could tackle aspects of the railroad. Plenty of history and geography to note. The natural sciences could discuss steam engines, coal, diesel engines, and how such heavy objects move. The humanities have a wealth of stories, poems, songs, and other works that involve railroads. Math could involve analyzing timetables or schedules. Language arts could involve writing promotional materials for railroads or describing particular historical events involving trains. Without more formal instruction on infrastructure, American adults may not (1) think often about how we all need to contribute to maintaining and building infrastructure and (2) have a good understanding of how it all works (not just the infrastructure itself but also related industries and aspects of social life). In other words, a lack of attention paid to infrastructure in school and learning may just contribute to a public that does not want to address the infrastructure issues facing the nation today. I use the phrase bundled choices because it seemed to me that there were some pretty striking patterns that emerged with these families in terms of how they set up their children’s lives. For example, I talk in the book about how choosing a neighborhood leads to a whole bunch of other choices—about schools, about the other people in the neighborhood. Decisions about who to carpool with, decisions about which soccer team to be on—you want to be on the same one as all your friends, and all these aspects of the kid’s life are connected to the parents’ choices about where to live. In my book, I’m trying to highlight this tension between the broad, overarching social structures that organize all of our lives and the individual choices that people make from within these structures. So yeah, if we had equal educational opportunities, people would not be able to make choices that would confer advantages to their child over someone else’s child, right? That wouldn’t even be a possibility. Certainly, the structural level really matters. But the best answer I can really give is that the micro level potentially could shape what goes on at the institutional or structural level. I really think—and this might sound kind of crazy—that white parents, and parents in general, need to understand that all children are worthy of their consideration. This idea that your own child is the most important thing—that’s something we could try to rethink. When affluent white parents are making these decisions about parenting, they could consider in some way at least how their decisions will affect not only their kid, but other kids. This might mean a parent votes for policies that would lead to the best possible outcome for as many kids as possible, but might be less advantageous for their own child. My overall point is that in this moment when being a good citizen conflicts with being a good parent, I think that most white parents choose to be good parents, when, sometimes at the very least, they should choose to be good citizens. This also sounds like Thomas Schelling’s work about how preferences for certain kinds of neighbors can aggregate to larger patterns of residential segregation. If everyone is just looking out for their own children, then larger structures develop. These findings suggest Americans have limited understandings of how to address the public good. Many such decisions seem to be binary: pursue what is good for your family versus what might be good for everyone. What about options that could be good for everyone in the long run? Does it always have to be a zero-sum game? According to Lendinghome, 54 percent of women want to live in the suburbs, while only 42 percent of men share that goal. Among women, 46 percent prefer established neighborhoods, while only 21 percent want an urban-like environment; for men those two options are nearly equally favored: 40 percent want an urban-like environment and 39 percent want an established neighborhood. One good thing about living in Chicago is that you can find neighborhoods that fit both criteria, said Julie Kim, realty agent with Century 21 in Lincolnwood. “One neighborhood I love showing to couples with this dilemma is Sauganash, which is still part of Chicago but gives that nice suburban pleasantville type of feel,” she said. Here is some speculation on why these differences might exist. The suburbs are often touted as the place that is better for kids because there is more space, the schools are better, and neighborhoods are safer. Since women are still often more responsible for the care of children, perhaps they prefer the suburbs because of their children. Additionally, many Americans see cities as less safe and women may feel this even more as they do not desire having to look out for their safety on a daily basis in the city. In contrast, men have less responsibility for childcare or don’t think about this as much as being in their future and cities then offer more excitement. If they do think of the suburban life, some may see it as a trap: going to work for long periods bookended by significant commutes, having to keep up a yard, a lack of neighborhood activity, and a life revolving around the nuclear family with little chance for getting away. I would guess that the preference for a suburban life goes up for both men and women with children but is lower both before couples have children and after those kids leave the house or become adults. 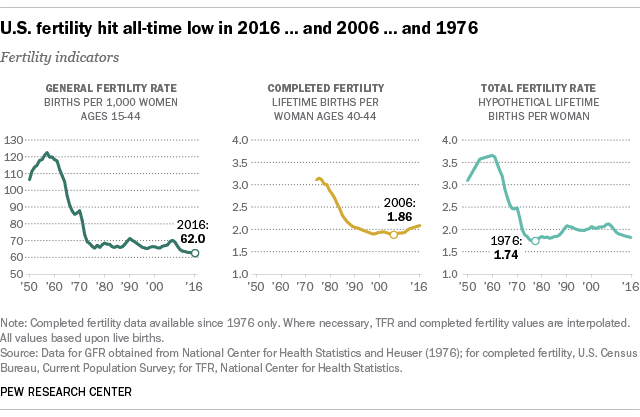 A new Pew report explains this statistical oddity: the annual birthrate in the US is down but women are having more children. Measurement matters and the different measures can fit different social and political views. I wonder if part of the issue is also that there is a clear drop in births from the earlier era – roughly 1950 to 1970 which we often associate with Baby Boomers – but the last 3+ decades have been relatively flat. This plateau of recent decades means researchers and commentators may be more prone to jump on small changes in the data. Many people would love to predict the next big significant rise or fall in numbers but a significant change may not be there, particularly when looking at multiple measures. Parents who can’t afford preschool typically leave their kids with a grandparent or someone nearby. Some of these informal child-care providers do offer rigorous educational activities, but others just leave kids in front of the television. The quality is more haphazard, and there’s a higher risk the option won’t work out. The book chronicles the awful experience of one low-income family in New York City that had to make 25 different child-care arrangements for their daughter by her fifth birthday. Many of these initiatives have support across the political spectrum. President Trump’s first budget includes a proposal to start America’s first paid parental leave program. On the campaign trail, Trump also pushed the idea of expanding the Child and Dependent Care Tax Credit to help make it more affordable for families to put their kids in quality preschool and childcare programs. This would be a good example of how the Matthew Effect begins: small differences in younger ages lead to divergent outcomes and larger gaps later in life. Bipartisan support for something? Better capitalize on this before polarization sets in.